Ralph Dayton of Danish descent? I am curious to discover the origin of the idea that Ralph Dayton was “an interpreter to the Indians”—has anyone found a primary source or even a secondary source that implicates him? 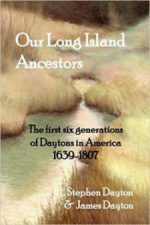 It is supposed that Ralph Dayton required passage for at least six family members including himself, his wife Alice, and children Alice, Samuel, Ellen and Robert.